The San Diego Downtown Travelodge is one of the most affordable lodging establishments that can be found in San Diego’s downtown area. 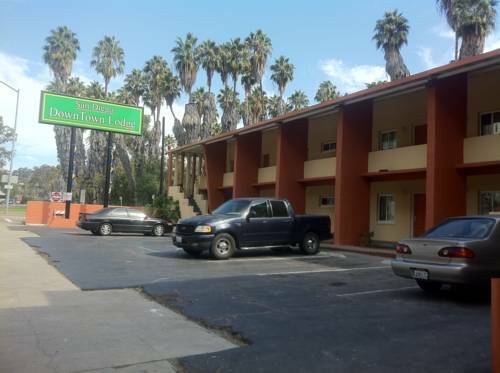 More specifically situated at 1345 10th Avenue, this budget-friendly motel is close to so many top rated attractions, including Balboa Park, which is where you will find the famous San Diego Zoo. Also within easy reach for San Diego Downtown Travelodge guests are the renowned Gaslamp Quarter and the San Diego International Airport, so location is definitely among the main perks. Luxurious might not be the word of choice when it comes to describing the Travelodge downtown San Diego. That being said, guests should find that the 33 rooms easily justify the already fair price. Standard amenities in the guest units include LCD TVs with cable programming, pillowtop mattresses, complimentary Wi-Fi, mini refrigerators, microwaves, heating, and air conditioning. San Diego Downtown Travelodge guests might also be happy to know that they can make all the free local calls they want, and it should be noted that the guest unit windows open. Available upon request are irons, ironing boards, and hair dryers. Outside of the guest units, there is a 24-hour front desk, and free parking is available on a first come, first served basis. In summary, the San Diego Downtown Travelodge can be a good lodging fit for travelers who don’t want to spend too much money on their downtown San Diego accommodations. The location is convenient, especially since there is a San Diego trolley stop nearby, and with the money that they save on rates, guests can have extra funds for a variety of things, such as a trip to SeaWorld San Diego or a ballgame at Petco Park.